Take a look a this free map of Pakistan here. Download the map to your PC, tablet or smartphone with iOS, Android or Windows. Or use it on your website. This free tourist map of Pakistan shows important places in Pakistan. There are not only natural places - mountains, seas or rivers, but political borders and important cities as well. There are some special marks for selected interesting places which you should consider when planning your holidays (subject to availability - eg. the best beaches, monuments, trekking, attractions). In Pakistan there are much more of such places, of course and we are preparing more free maps which can provide more detailed information for your travel. Right now we recommend to visit for example these interesting places in Pakistan: Pakistan offers a lot of attractions to tourists - from trekking to mountains to ruins of old civilizations. Islamabad is the capital of Pakistan with the Faisal Masjid mosque, the National Monument, the Pakistan Museum of Natural History and many other museums, parks and monuments. Pakistan has also some deserts, forests, hills and even several peaks over 7,000 m, like the famous K2. If you prefer culture and architecture, you will probably like some of the old fortresses in Pakistan, the famous cultural city of Lahore with Shalimar Gardens, the Tomb of Jahangir, Badshahi Masjid and the Lahore Fort UNESCO). But Pakistan has more UNESCO sites, for example the archaeological ruins of the Indus Valley Civilization, the ruins of Taxila and the Historic Monuments of the ancient city of Thatta.These are just selected interesting places in Pakistan. There are much more sights and things to do, for example off the beaten tracks, off the main tourist trails. Some more information you can find on other maps here. >>> How to use this map of Pakistan: Most of the maps can be enlarged using the button Full size. If you want to download this free map of Pakistan to your PC, smartphone or tablet with Android OS, iOS, Windows or Linux, press the Download button. And to get a link to this page with the map press the button Link to. Some more information is below the map. Icons for the best beaches, trips, monuments, treks and other places of interest located on the map are only approximate. This map of Pakistan as a free download is designed for cell phones or tablets with all systems, including Android, iOS, Windows, Blackberry, Tizen, Firefox OS, or Symbian or for laptops with Windows, Mac OS, Chrome OS or Linux, but you can use it on your website as well. Why we offer this map as an image - the bitmap? Because you can use it off-line. Because you can make marks and notes to the map, just use a convenient graphical editor. And because it does not take up much space. Please note, however, that because this map of Pakistan is available for free as an image - the bitmap - it can not of course be used with GPS. For use with GPS geolocation we recommend to use an appropriate application with custom maps. For Android and Apple iOS there is an OsmAnd applications available which offers the option to download offline maps. 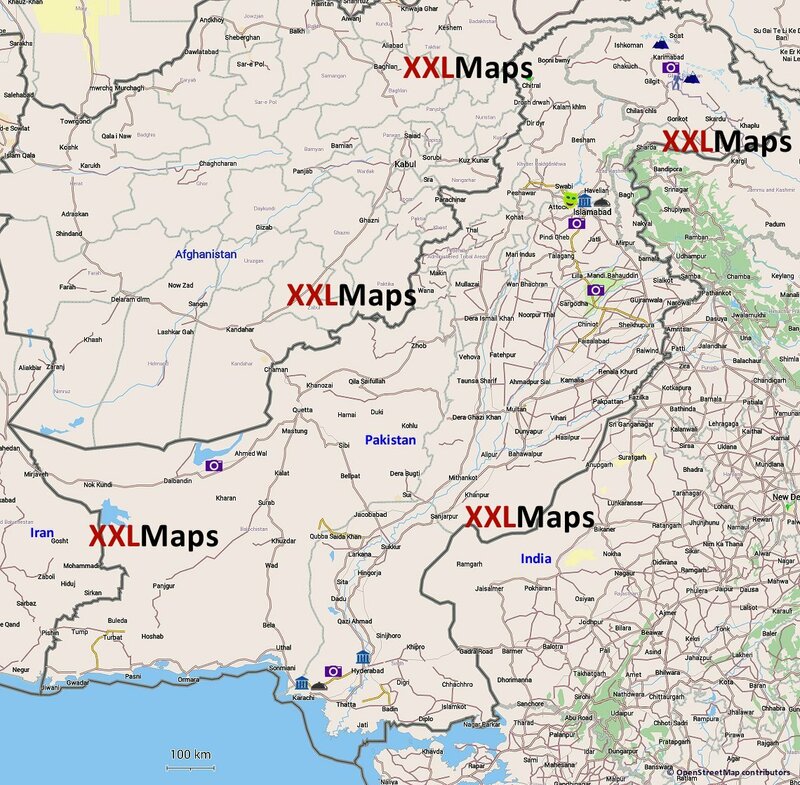 This map of Pakistan, as well as other maps here on XXLMaps, can also be used on your website, in your printed materials and so on. If you want to use more than 5 maps from XXLMaps on one web domain or in one material, or want to edit the maps, please contact us. Otherwise, just download any map to your site, insert it as an image, and put beneath it an active link to the page on XXLMaps where the original map is located. When used in print always mention the source XXLMaps. In all maps with the exception of maps of continents and the world must also be maintained in the readable form this information about the underlying data source: © OpenStreetMap contributors. Another data used in the maps come from public domain sources such as CIA Factbook, unless otherwise stated at the map (if it is, then you need to indicate such source also).